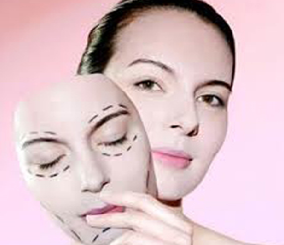 A facelift is a surgical procedure aimed to make one look young and fresh. Skin’s age and youthfulness is dependent on genetic,hereditary , environmental factors, gravity and stress. Facelift procedures reverse all those visible signs of aging around the face and neck. Creases around eyes specially below the lower eyelids, tear trough below the eyes. Loose skin around chin and jaws that creates jowls. A facelift procedure or rhytidectomy (as clinically known) tightens skin and repositions muscles and fats to give you youthful looks. A facial rejuvenation procedure is generally involves a facelift in conjuction with brow lift for sagging or deeply furrowed brows and a Blepharoplasty or eyelid surgery to rejuvenate the eyes. Healthy individuals between 40-70 years of age who have started portraying signs of aging are appropriate candidates. The skin needs to have elasticity and natural suppleness to conform and retain the improved look. A well defined bone structure gives better results than a less distinct featured face that may need to undergo other procedure to get desired results. Dr. Ree Age would first understand your medical history, habits and the changes desired. She would examine the skin properly and then let you know the achievable goals and the exact procedure required for the same. In some cases, the facelift procedure may be combined with other surgical or non-surgical procedures to give best results. Smoking to be stopped for about 2 weeks prior to surgery allowing free flow of oxygen to the body. Stop usage of aspirin and medicines, herbal supplements that thin the blood or vitamins like Vitamin E.
The procedure takes two to six hours depending on the areas targeted and the patient’s expectations. The procedure generally requires local anaesthesia but general anaesthesia or intravenous sedation may be needed in certain cases. Procedure may involve Full Facelift or traditional Facelift targeting a larger area, Mid Facelift or Limited incision facelift targeting cheeks and jowls or neck lifts for sagging neck skin folds, jowls and double chin. The general procedure involves making incisions at the temple that run along the hairline till behind the ears giving clear access to the tissues below the skin. The muscles are tightened and fat redistributed or sculpted creating a more pleasing and fresh look.Skin is redraped over the uplifted contours and excess skin trimmed . Incisions are closed by stitches or staples. There would be bandages and drainage tubes. A concurrent liposuction of the under chin fat deposits , a lower lid blepharoplasty, fat / dermal filler injection of the hollowed folds and creases , laser resurfacing of the skin to improve the tone and texture of the skin are done in conjunction with facelift to complement the rejuvenated look. Minimal access cranial suspension/ limited incision facelift: to address the midface deflation and jowls. In this procedure the incision is limited to the temple and ears alone. Endoscopic Facelift: mainly used for mid and lower facelift make Incisions of an inch or less. The surgeon removes excess fat or lifts the muscles with the help of the camera. S-Lift: S-shaped incisions are made in front of the ears for improving the jaw line. Deep Plane lift: The entire facial structure is lifted as one single unit. Though the technique is very effective, it involves a lot of risks. Subperiosteal Facelift: Incisions are made below the lower eyelids or inside the mouth to improve the mid face sagging. Very few doctors are experienced to perform deep plane or subperiosteal facelifts. Ointments and creams as recommended by the surgeon. Smoking not recommended for the next two weeks. The healing time is usually three to four weeks. You may need to visit the surgeon several times during the healing period. However, it may take more time to see the final outcome. The surgeon would remove the stitches and bandage few days after the surgery after having inspected the condition of bruises and swelling. You may resume office after two to theer weeks of surgery. Every surgery has certain risks. People with heart diseases or auto immune disorders may experience more complications. Smokers are at the risk of more complications and delayed wound healing. Contact and visit your doctor immediately if you experience very high fever/ stitches open unexpectedly, extreme pain or any abnormal discharge from the surgical wound. The procedure does not change the fundamental face contour or stop skin aging. Facelift procedures are used to reduce the telltale signs of age and weight loss. It is not a permanent solution and cannot hide all your years of experience; however the youthful look can stay for approximately eight to ten years.